Local 8782 was first chartered in 1979. With more then 1100 brothers and sisters working in the steel industry in Nanticoke Ontario we are proud Canadian steelworkers and we collective bargain for Stelco LEW, Stelco Pickling Division, Harsco and ESM. Payment date is still unknown at this time. We have had a lot of questions regarding changes to the E.S.A. with Bill-47. I've attached an article that explains the changes. 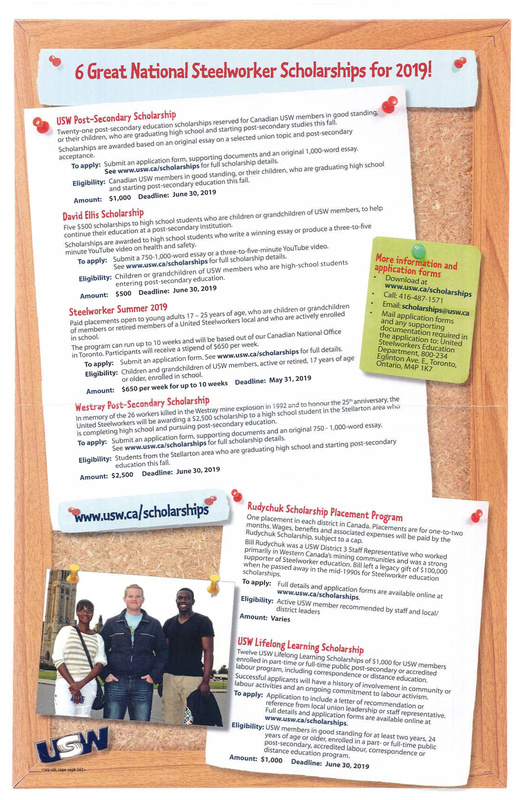 Click the link below for a PDF version of the article. If you would like a copy of Chapter 14 - Bill 47 you can download it here Bill-47. Any information about arrangements for the passing of our members would be greatly appreciated. Brian Jones was a Retiree from the HSM mechanical department. Jim Ballyns was a retiree from the H.S.M. We are saddened to announce that Ron passed away on July 15/2018. Ron was a long time pickle line employee, he was also the bargaining unit Health and Safety co-chairperson for many years. We are unaware of any arrangements for Ron. 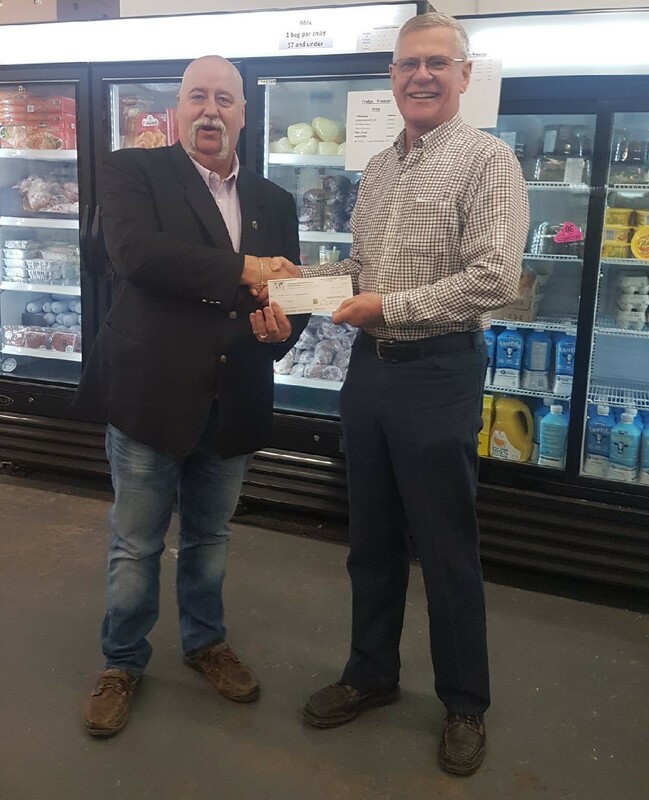 On Wednesday Dec.19/18, Randy Graham on behalf of USW Local 8782 and the United Steelworkers Humanity Fund, presented Al Martens, Administrator of Simcoe Caring Cupboard a cheque for $1700.00. The USW Humanity Fund contributed $188,800.00 to 112 Food Banks across Canada during the 2018 Holiday Season, $14,950.00 of which was distributed in Southern Ontario including this donation. On Saturday Dec.08/18 some of the executive and their family helped the Salvation Army with their annual Christmas dinner. The Local members served a turkey supper that was prepared by the Salvation Army for some less fortunate members of our community. From left to right, Terry and Lesa Barnard, Mark Lombardo and his Mother Donna, Randy Graham, Donna Wingrove, Rob and Paula Bussey and Fred Sebring. On Friday Nov.23/18, the United Steelworkers Local 8782 along with Stelco, were pleased to present to the Salvation Army in Simcoe, a donation of money, food and toys from our annual Christmas gate collection. Our members along with Salaried personnel stood in the frigid temperatures to collect $12,000.00 in cash and 1188lbs in food and toys for those in need! The company pitched in an additional $5,000.00 to bring our cash total to $17,000.00. We are proud of all workers at Stelco Steel for their generosity in making Christmas just that much better for some less fortunate. 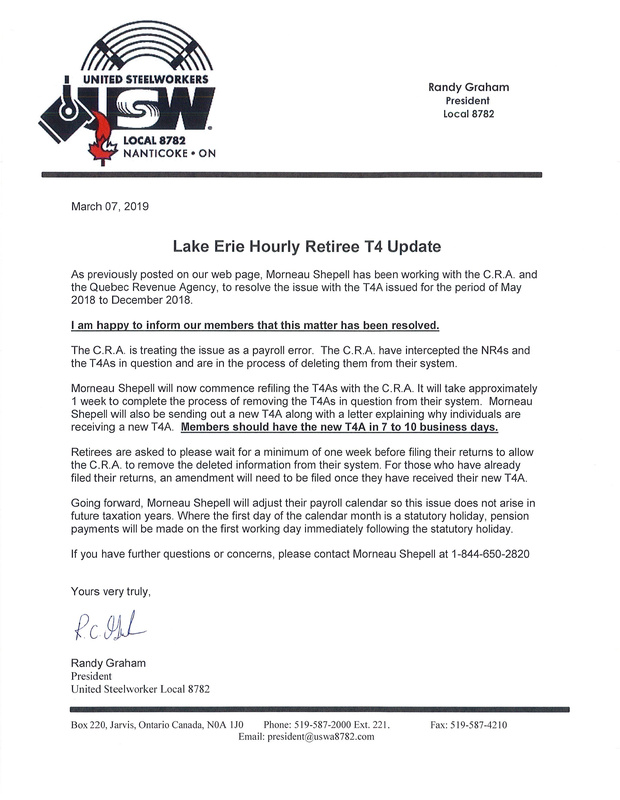 USW Local8782 would like to thank you all! For additional Christmas party photos click the link below. 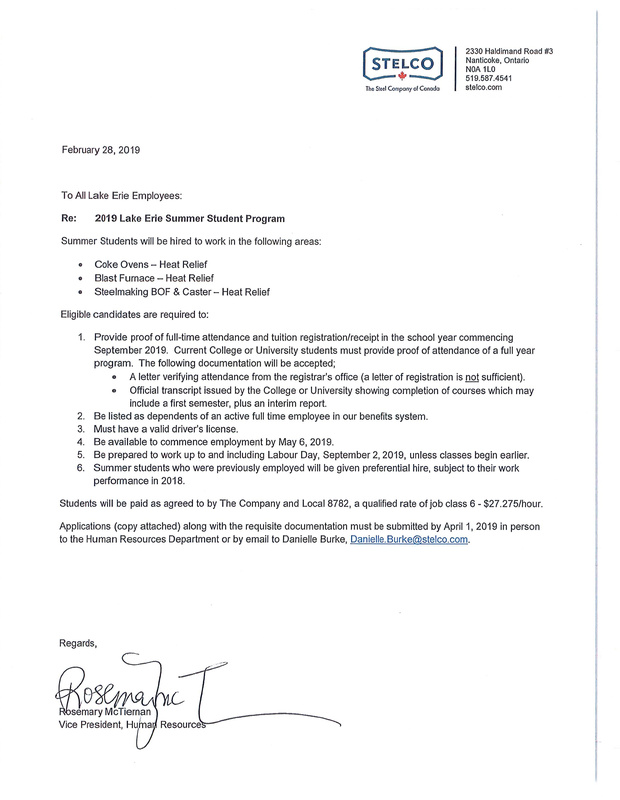 Today, United Steelworkers Local 8782 recognized Stelco Coke Ovens Supervisor and former Steelworker, Steve Hammond with a " Life Saving Award " for his efforts in the preservation of a life of one of our members, Jonathan Goetz. Pictured above; Local President Randy Graham, C.O. Supervisor Steve Hammond, Jonathan Goetz and his partner Sadie and Employee Welfare Coordinator Terry Barnard. 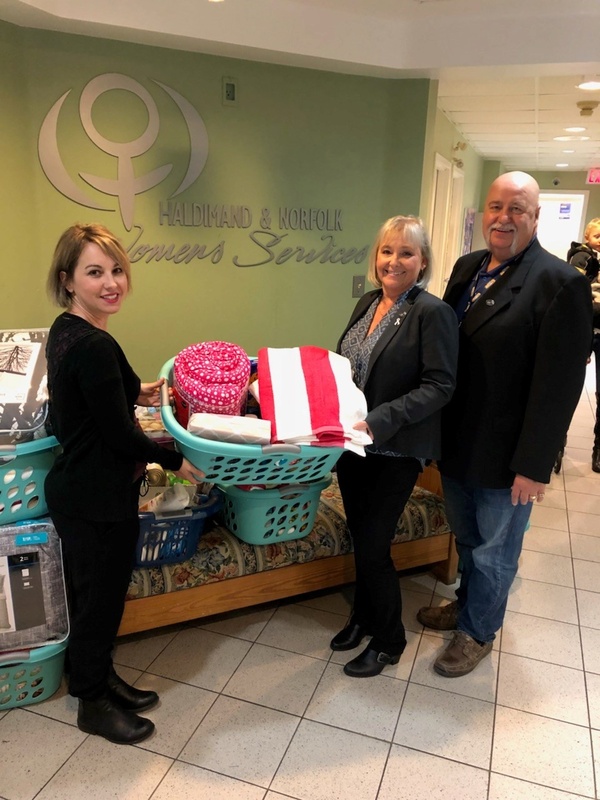 Haldimand Norfolk Women's Services received a donation from United Steelworkers local 8782's Women of Steel and our SOAR chapter 6-05. Pictured left to right, Kelly Salazar (Residential Services Manager), Donna Wingrove (WOS Chair) and Randy Graham ( Local President).